A surveyor hired by CARE is directly responsible for producing the official inspection report for the discharge of food from a ship. CARE staff, counterparts, or a clearing and forwarding agent should also make frequent visits during discharge, delivery, and packaging of the food to observe the quantity and condition of the food, monitor the extent of marine losses, determine the shipping company’s responsibilities, and be able to report losses accurately to the donor. Damage may result from inadequate packaging of the food in the country of origin and not because of improper handling during shipping or discharge. Description of packaging deficiencies, e.g., material or seals to close packages are weak. Include any results of an independent analysis of the packages in the survey report. If samples are appropriate, draw a one kilogram sample from each unsatisfactory sub-lot of ship's cargo. Sweepings are spillages collected in the ship's holds, collected from slack/torn bags, or collected after repacking. The independent surveyor must determine the total weight of the sweepings, the number of units that can be reconstituted (e.g., how many 50 kg bags), how much is lost and how much is to be declared unfit for human consumption. Losses from sweepings should be included in the survey report and treated as marine losses. Spillages that have occurred in port transit sheds or other interior warehouse while in CARE’s possession should be treated as internal losses. A sample of bags should be examined for possible insect infestations during the survey (see chart on Sampling Guidance below). If the sample shows the shipment to be infested, the survey report documents the inspector’s health certificates, the amount of the original shipment, the amount able to be repackaged, and the amount that may be unfit. If there is evidence during discharge that bags or containers are not standard weight (short or excess), CARE or its counterpart must insure that bags are not dispatched from the port until food is placed in standard weight packages. CARE, its counterpart, the shipping company, clearing and forwarding agent, independent surveyor and port authorities must set aside the bags and containers for later repackaging. Any losses would be the responsibility of the shipping company. If circumstances require that short weight bags be dispatched, the quantity of bags and reasons for dispatch must be stated on the dispatch waybill. The surveyor’s report should include a narrative stating where, when, and how short-weight losses may have occurred. Ports often require that bags be weighed during unloading to limit their liability. They then issue an "official weight" based on their calculations. Port documents often are not completed with a high degree of accuracy, and/or the port authorities do not release these reports to CARE, its counterpart or the surveyor. The presence of CARE staff and independent surveyors may insure greater accuracy of the port reports. CARE or its agent should request, in writing, copies of all port documents for claims purposes. Country offices must keep files of all requests to ports, even if the port does not respond, to show auditors and donors that efforts were made to obtain the information. A sample of bags or tins should be weighed at port in the presence of a shipping company representative, the independent surveyor, and CARE, its counterpart or other representative. The sample weight will determine the uniformity of unit weights in the shipment. (See Sampling Guidance below). 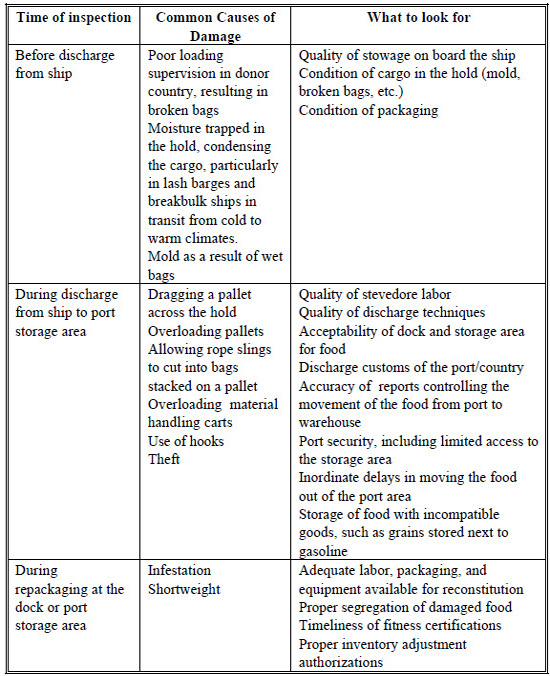 Most ports do not have adequate facilities to properly package food to a standard weight. Bags from this source should be monitored closely. Because of lax oversight and faulty bagging equipment, there is a greater incidence of short-weight deliveries. The range of tolerance must be negotiated with the donor. In some cases, donors establish weight tolerances for shipments from their countries. The Procurement Office in CARE USA Headquarters should advise country offices of acceptable weight variances for all U.S. Government donated food. Country offices should obtain the same information from non-U.S. donors. The tolerance range should be known only by the person authorizing repackaging (i.e., the port officer) to avoid collusion among those handling the food. All packages that do not fall within the tolerance range permitted by the donor must be re bagged before they are transported to warehouses or centers. 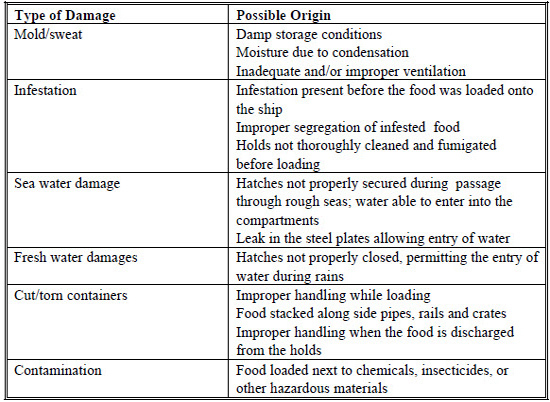 Occasionally, a ship will discharge more food than stated on the Bill of Lading. The shipping company offers the food to CARE. 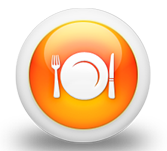 The shipping company accepts responsibility for any storage charges levied on the excess food. A Health Authority certifies that the food is fit for human consumption. The shipping company agrees to pay any customs duty levied against the excess food.